Shared or Distributed HDFS – What’s Right for Me? If you’re running Hadoop for big data analytics this webinar is for you! Currently, there are two competing architectures for how to implement Hadoop Distributed File System (HDFS). The original HDFS approach utilizes storage co-located with the compute servers, but that can often present challenges of wasted compute and/or storage when you scale. An emerging alternative relies on dedicated storage resources shared by the compute cluster, providing a cost-effective and reliable solution. Join Engineering Fellow and Chief Data Scientist Janet George, as she compares and contrasts these two approaches and provides definitive quantities guidelines to planners and architects to help identify the best solutions for your Big Data and analytic needs. 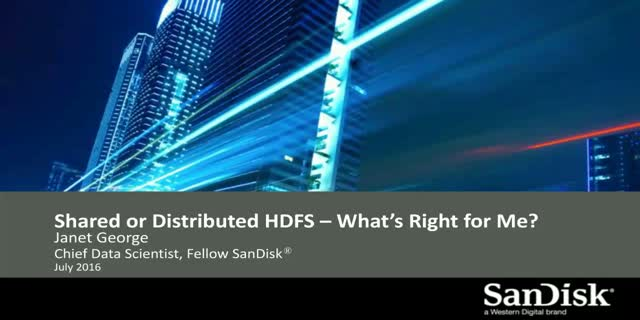 Title: Shared or Distributed HDFS – What’s Right for Me?